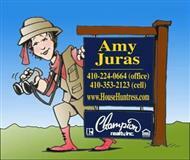 Large lots and huge homes comprise this 1999 community of Chesapeake Preserve. Lots are no less than a half acre but the more standard lot can be above an acre. Some of the community even backs up to Sandy Point State Park. Very little has sold in this community and currently there isn't anything for sale. The last property sold for 850k back in January of 2006. But fear not my friend, if you have your heart set on this community, the House Huntress will find you something. For I know all, and tell all for my clients!